After taking off and putting the cover on my boat every week-end for the last couple of months I have come to the conclusion that without a doubt it has to be the best designed and built boat cover ever made. I easily take it off and put it back on by myself and then catch myself standing there looking at the workmanship that went into it with amazement. Please pass this along to your canvas/upholstery man! The tee top is awesome as well and provides plenty of shade and does not obstruct fishing at all. Sorry we missed you at your owners tournament. Thanks again to you and your whole bunch. I just wanted to drop (and the rest of the Pro-Line team) a note saying thanks again for the excellent custom aluminum work on my boat. I was very impressed with the quality and turnaround time on the work, as well as how professional and courteous your team was. I can't wait to use my new poling tower and casting platform, and the look of the grab rails (last minute addition!) turned out great! I will gladly recommend your team to anyone looking for quality custom aluminum/canvas work. P.S. It was nice meeting you guys in person at the S.A. Boat Show, and the new Stilt is one fine looking skiff! I ordered on of your Line Minders for my new custom 18-foot Andros Boat Works flats boat last week. We fly fish for monster bones here at Coach Duff's Hawaiian Bonefishing on the island of Oahu. You rushed my order, overnighted it to me and it is a beautiful piece of equipment. It actually makes my boat look better. 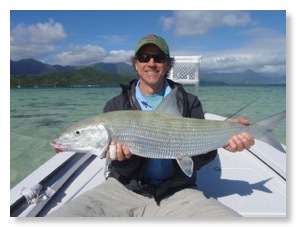 On it's maiden voyage it performed flawlessly and my client Mark Hopkins landed this 12 pound trophy of a Hawaiian Bonefish! I thank you so much and tight lines! I thought I would take just a moment to thank you for all of the fantastic work you've completed on my Grady-White. Just telling you how satisfied I am is not nearly enough however. Please allow me to explain. As a full time paramedic on a helicopter I can assure you that I've seen things go wrong. This is usually the result of a significant oversight on the part of someone. The "experts" generally have a field day pointing out the areas of compromise. It's with this in mind that I approach my offshore activities. "MorganLynn" takes us 50-75 miles offshore as a matter of routine. We run no less than 125 hours a season with every age group and experience level joining us on our trips. For this reason I accept only a no-compromise approach to the way we boat and the work that is done on her. 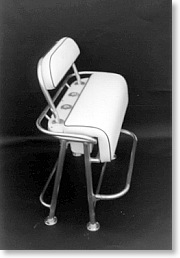 In the past years you've created seats that have enhanced our boating comfort and safety. 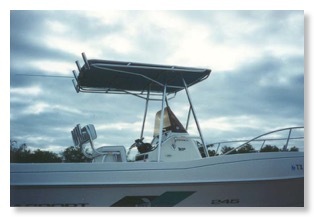 In addition to the seats you've developed a diving platform and ladder assembly that is truly second to none on the Gulf Coast. With the end of this last season we found time for "MorganLynn" to have a major overhaul (she's 12+ years old). Your work on her new fuel system will take us well into our grandchildren! ( I hasten to add that my wife and I have young children). My point, you've done your work right, it's uncompromising and it shows! By the way, Grady-White could take several lessons from you and I did not hesitate telling them just that. I just returned from the "maiden voyage" on my newly refurbished Shallow Sport and I've got to tell you that I could not be more pleased with your work! I have never been more comfortable on the twelve-mile ride back to Port Isabel from my normal stomping grounds up by Three Islands. This is the way to fish! Also, during the TIFT tournament, I can assure you that there wasn't a better looking or more thoughtfully equipped boat on the the flats than mine, thanks to your efforts and attention to detail. I sincerely appreciate your help in finally getting my boat into its present customized form. unique and completely custom tower. Tim spent as much time with me as I needed to help spec out all the details and confirm all the sizing, placement, and overall design. Tim made sure I was completely satisfied before performing the final welds and mounting the tower. The tower is awesome! It is more solid than I imagined and does not squeak or rattle at all. After doing business with you for 13 years, encompassing aluminum work on 6 different boats, I can offer my absolute highest recommendation on your professionalism, honesty, customer service and workmanship. Theres not much you haven't built for me and in every case the product was delivered on time, on estimate and as promised. With all the work done and the abuse I put it through your product has never failed. You're a true craftsman whose attention to detail is unsurpassed. Yours and Leslie's hard work over the years has earned Pro-Line the reputation as "Best in Class". I just wanted to take this opportunity to thank you and all of the rest of the gang for the great job done on my Shallow Sport. Pro-Line is truly a professional organization with a talented and friendly staff. When I returned home and filed your invoice I noticed that there was no charge for the canvas cover that was installed on my console. Enclosed please find my check for $85.00. Thanks so much for manufacturing the casting platform for my Icey-Tek drink box. Your team is professional, courteous, expeditious and a pleasure to do business with. It's nice to know I have a custom shop to go to, considering my oddball request. Great work! I am taking time to write a review on Pro-Line Custom Aluminum and Canvas. I bought a Monterey 198LS boat that did not have a tower designed for it. I researched the web and found on a wakeboard forum that Pro-Line had built and designed wakeboard towers with great results and quality. I drove the boat from the Dallas area and talked to the designer there and when I returned the tower was totally awesome! The quality and workmanship were great, thanks for the great product. Please find enclosed payment for the tower you recently shipped to the Rio Grande Valley for me. I have not yet laid eyes on it personally, but I've seen enough of your work to know it will be first class. It's not often I encounter treatment good enough to draft a letter, but everyone at Pro-Line Custom Aluminum went well beyond the normal bounds of customer service in taking care of me. Your were extremely responsive to my initial phone calls, and the tower was completed much more quickly than I ever expected. Once the tower was ready Courtney called to let me know the UPS shipping cost to a private residence on South Padre Island was exorbitant, but I resigned myself to that fact. Courtney then went to the extra effort to find an alternative shipping method and called me back to let me know she could save me substantial shipping costs, even though I had approved the higher cost. The level of care for your customers that I have encountered is found far too infrequently, especially in the pleasure boat market. Not only will I heartily recommend you to friends and acquaintances looking for a new boat, or some aluminum work, but I plan to go out of my way to let people not currently in the market for one of your products know that they should consider you in the future.